Taxes are a complicated matter. Pastors have it harder than most: their financial well being and local reputation intersect at this confusing juncture. With this tool, pastors can understand their tax status and systemize their payments. Use this material in one of your regularly scheduled meetings or as an introduction for someone new to pastoral ministry. What concrete difference does it make if you’re an employee or self-employed? 20 guidelines for establishing the right employment status. Voluntary Withholding—How Does It Work? One option that can simplify the pastor’s taxes. Four tax rules that are available to ministers. 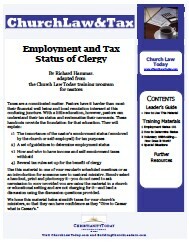 Books and websites to help with your church and clergy taxes.